The ART practitioner is specifically trained to locate the scar tissue and release the adhesions that have glued together surrounding soft tissue. How is ART Different from other therapies? Historically, professional education for the treatment of muscle, tendon, fascia and nerve problems has generally been neglected. Little progress has been made toward identifying the relationships of moving tissues to one another. Soft tissue care has mostly been confined to rest, ice, drugs, exercises, stretching, manipulation, acupuncture and massage. These therapies either work to strengthen surrounding muscles or attempt to increase blood flow to the region, thereby speeding up the body’s own recovery process. They do not however address the source of the problem; that is, the scar tissue or adhesion site. The pain does not go away by itself because the body has begun to function differently. The inflammation and scar tissue impair the blood supply and set up an ongoing cycle that is self perpetuating. Even stopping the activities that aggravate the condition rarely leads to resolving the problem, as the underlying tissue changes are still present. A return to work or to sports often means a return of the condition. The only way to permanently fix the problem is to break down the scar tissue and release the adhesion. 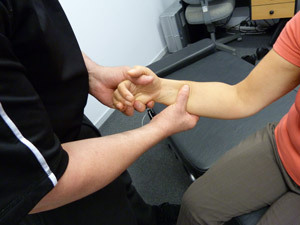 Active Release Technique providers are able to locate and release these adhesions through the use of specific protocols that lengthen the muscle and facilitate the break up of scar tissue. ART can help people who suffer from pain, numbness, weakness, burning, tingling or loss of motion. ART works well on many common workplace injuries that result from repetitive strain (eg. carpal tunnel syndrome, elbow tendinitis, and neck and lower back pain). ART is effective in resolving different types of headaches and migraines that often linger after a whiplash accident or result from long hours of deskwork. ART has also been shown to be highly effective with sports related injuries. The repetitive stress that results from intense training causes such conditions such as swimmers shoulder, tennis and golfer’s elbow, shin splints and other forms of tendinitis. In addition, elite level athletes use ART to increase their mobility and thereby enhance their performance. In their case any restriction in motion can mean the difference between a gold medal and not even reaching the finals. Treatments can feel uncomfortable during the movement phases as the scar tissue or adhesions "break-up". This discomfort is temporary and subsides almost immediately after the treatment. It is common to feel a duplication of your pain symptoms during the treatment (a good indication that the problem has been identified). Patients report that "It hurts good".